I NEED TO...consolidate VDI images. Everything you need to know before taking your virtualization journey. Ivanti is your one-stop-shop for user-friendly desktop and mobile provisioning. Learn how user virtualization performs and adds value to your business. IT adopts VDI to centrally manage and secure desktop environments, reducing risk and saving time. Unfortunately, user resistance is the leading cause of desktop virtualization implementation failure. With VDI, it’s difficult for users to personalise desktops. Logon times lengthen. Printing is problematic. User experience suffers. IT needs to make VDI user-friendly. Reducing VDI complexity and improving user experience is the key. When user-specific information is separated from the underlying OS and applications, VDI implementation and management is easier and user acceptance increases. When user settings and files follow users, desktop replacement and mobile user support is easy. Removing admin rights and then specifically elevating user privileges on a per app or per Windows component basis reduces corporate risk. Reducing the number of OS and application images maximises the number of users per server. Ensuring desktop, OS and app settings are consistent maintains high-functioning desktops and reduces help desk calls. Modifying a golden image ‘in-flight’ reduces maintained images while still supporting each user’s work needs. Automatically separating user information from the OS reduces the manual effort needed for desktop virtualization projects. Deliver fast logons, targeted printing, and a user experience that’s consistent between devices and location. Retain personal settings between sessions to empower users and increase VDI acceptance. Solutions from Ivanti reduce the manual effort and resources needed to implement and manage VDI by extracting and centralising user apps, personalization, and files, then applying controls to secure VDI endpoints and boost performance. End users get what they need to be productive from any location, on any device, while IT can manage distributed users and desktops from a centralised location. This approach ensures that endpoints are protected and users get a great computing experience. Enables IT to retain endpoint control while empowering users by precisely manageing user privileges and access to applications. Prevents unauthorised code execution without complex white- and blacklists and enforces software licencing. Enables IT to personalise desktops on-demand and apply contextual policies to help protect endpoints. The powerful, point-and-click policy engine adopts desktop configuration based on user context and dramatically speeds up logon times. Allows IT to deliver a highly responsive desktop, ensure consistent application behaviour, and improve user density, while reducing hardware costs and extending hardware lifecycles. Protect and leverage VDI investments by ensuring user acceptance and reducing related IT tasks and costs. Prevent users from utilising consumer cloud services by giving them the simple, ubiquitous file access experience they expect. Intelligently manage CPU and memory resources to eliminate rogue processes and memory- and resource-hungry applications. Complement existing security and management controls with application control, privilege management and lockdown, plus self-healing and highly granular auditing. Replace slow and corruption-prone roaming profiles with a just-in-time user personalization approach that’s fast and ultra-reliable. 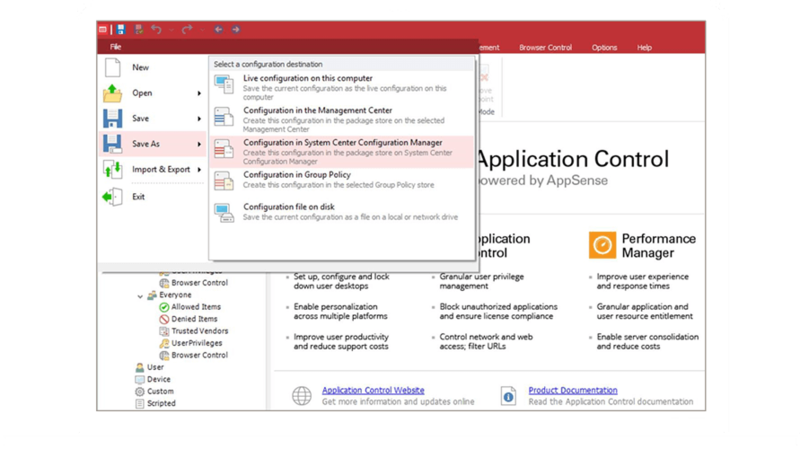 Reduce logon script and Microsoft Group Policy Object complexity with a powerful, easy-to-use policy engine that adapts desktop configuration based on user context. Deliver a personalised desktop to every user, every time, and retain user personalization changes from session to session. NEED TO CONSOLIDATE VDI IMAGES?